Just as the Golden State Warriors’ record setting 2015-2016 NBA regular season captivated millions worldwide, the team’s average home ticket price shot up to become the highest in the league. 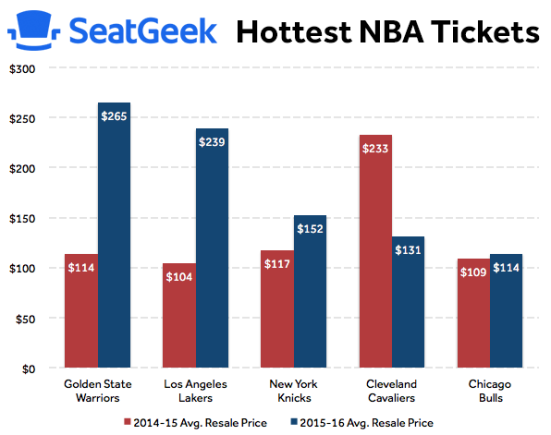 Already the third most in-demand ticket in the NBA in 2014-15 – with an average resale ticket price of $114 – Warriors home game tickets more than doubled in price to $265, an increase of 132 percent. The Lakers, thanks in large part to 2015-16 being Kobe Bryant’s final season, were not far behind the Warriors with an increase of 130 percent. Even when excluding Bryant’s last game of the season against the Utah Jazz, the Lakers saw an increase of 88 percent, which would have been good for third in the league. Surprisingly, the team with the biggest price decrease last regular season was the Cleveland Cavaliers. Despite the team sitting atop the Eastern Conference for the entire season and eventually going on to win the NBA Finals, Cavs fans could not match the excitement that they showed in LeBron James’s first season back from Miami. However, despite the team’s average ticket price falling 44 percent from a 2014-2015 regular season price of $233, Cleveland’s 2015-2016 price of $131 was still the fourth highest in the league, behind only the Warriors, Lakers, and Knicks. The only other team that saw a decrease in ticket prices was the Houston Rockets, who limped into the playoffs and quickly made an exit after finishing as the second seed in the Western Conference in the 2014-2015 season. Interested in sports ticket data and want to read more things like this? Click here to subscribe to our bi-weekly Ticket Tracker newsletter!